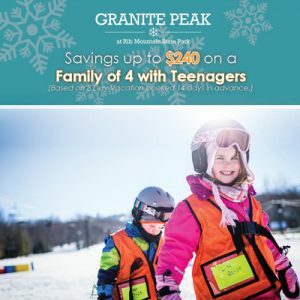 Granite Peak is a Mountain of Family Fun! Granite Peak Ski Area in Wausau offers 700′ vertical, 75 runs, and 3 high-speed lifts — for authentic mountain skiing in the heart of the Midwest. Pack-up after breakfast and be on the slopes at Granite Peak in the afternoon. Make the trip on your schedule. Simple. Stress free. No surprises. High-Speed Lifts At Your Service! Almost all of 75 runs are served by three high-speed to get you up the mountain fast! Over a long weekend, that translates to miles more skiing and boarding. Ski All Day — And Then Keep Going! Granite Peak really lights up at night, with most of the runs lit for night skiing. So, even when the sun goes down early, you still have hours to go on the slopes! Always Order Early and Online! Never pay full price at the ticket window! Book online at least 72 hours before you arrive and save up to $40! Central Reservations Make Booking Easy! Enjoy the convenience of one-stop shopping. 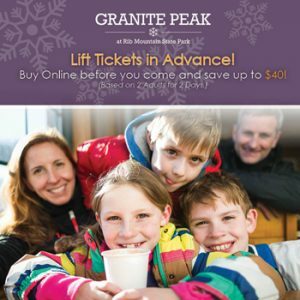 Granite Peak’s website lets you compare hotels, book ski-and-stay packages (with discounted lodging rates), buy lift tickets, and reserve rentals and lessons…it’s easier than ever to plan your Granite Peak vacation. Visit Their Website to book or for more information or call (715) 845-2846.